Most parents assume that the products they purchase—particularly those that are designed to be used by or on children—have been tested extensively to ensure their safety. However, when childcare product designers, manufacturers or retailers put profits above the safety of consumers, serious accidents, injuries, and even deaths can result , all of which are especially heartbreaking when the victim is a child. Unfortunately, children being injured by dangerous, defective, or improperly labeled childcare products is anything but uncommon. In fact, a child is treated in the emergency room for a toy or nursery product-related injury once every three minutes in the United States, according to a study conducted by researchers at the Center for Injury Research and Policy at Nationwide Children’s Hospital and published in the journal Clinical Pediatrics. When a child is injured by an unsafe product, the person or company who caused the injury should be held responsible. If a defective childcare product harmed your child, they may be eligible for compensation. Here's what you should know. Products made for children, or those with which children are likely to come into contact should always be tested for safety and feature labels that clearly warn the consumer of any potential hazards associated with their components or use. When designers, manufacturers, or retailers fail to follow safety regulations or exercise reasonable precautions, they may be held liable for injuries and damages that occur as a result. Choking hazards. Toys or products with detachable parts or that are small enough to fit entirely inside a child's mouth could block the airway. Lead paint poisoning. Paint with a lead content that exceeds the legal limit can cause a wide range of side effects. Age-inappropriate toys. When toys or products are marketed to children who are too young to use them safely, injuries can occur. Lacerations or punctures. Children can sustain lacerations or punctures from toys or products with sharp, pointed or jagged edges. Burns or electrical shock. Electronic childcare products or toys that overheat can cause burns or electrical shock injuries. Strangulation injuries. These injuries can come from poorly designed, age-inappropriate children's clothing—such as items for infants or young children that feature long drawstrings or belts—or toys or household items with long wires or cords. Dangerous packaging. Product designers and manufacturers fail to adhere to child-resistant packaging standards put young children at risk. Oftentimes, consumers continue to use a recalled product because they are unaware the product has been recalled. Parents who are concerned about the safety of their childcare products can check the Consumer Product Safety Commission's Recall List to see if a recall has been issued for any of the items they use. 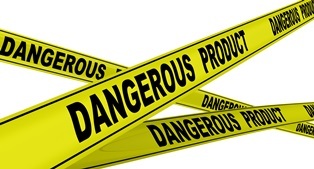 Do You Need a Product Liability Attorney? If your child was injured by a defective, unsafe or improperly labeled toy or child care product, he deserves justice—and maybe even financial compensation. The Delaware product liability attorneys at the Morris James Personal Injury Group can help you fight for a financial award that covers your child's accident-related medical bills, as well as pain and suffering, and more. Contact the Morris James Personal Injury Group today to schedule a free initial consultation to discuss your case at 302.628.6918.